I think I might get back into adding a small amount of fat to the bread I cook. My typical recipe is just bread flour, water, yeast and salt in the ratio 100:70:2:2 but, on Monday night, I substituted about 5% of the water with olive oil. 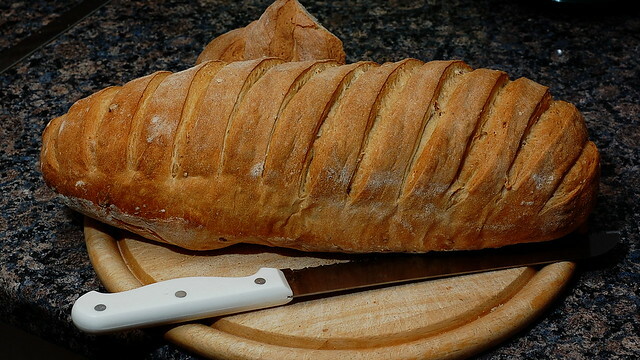 The dough seemed a bit easier to work, the bread cooked very evenly and the texture and taste were fantastic. The even shape may also have been helped by the relatively deep slashes I put in the top before cooking, allowing plenty of gaps for expansion rather than relying on it doing its own thing in an aesthetically pleasing way! I’ve been reading your bread posts. I read somewhere the other day a recommendation to knead on a lightly oiled surface as opposed to a floured surface which I’m going to try. I already use Olive Oil in my breads. Was that in Dan Lepard’s book? I read that a while back and seem to recall he advocated an oiled surface. However, I find that a wooden board and a plastic scraper are enough to keep things clean in the first stage and just a light dusting of flour is needed later on.